Young market researcher Dave Power founded J.D. Power and Associates in 1968, a year when revolutionary cultural and political changes abounded. Power's efforts to help the auto industry understand the value of listening directly to the voice of the customer -- the unalloyed preferences, complaints, and kudos collected from the drivers themselves -- proved to be revolutionary as well. His mission to help companies improve overall customer satisfaction would not only change how the auto industry operated; it affected the way nearly every manufacturing and service industry sought out and responded to customer feedback. POWER: How J.D. 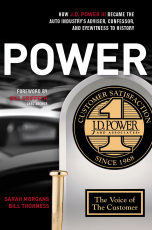 Power III Became the Auto Industry's Adviser, Confessor, and Eyewitness to History features Power's recollections, as well as the perspectives of those who worked most closely with him, providing compelling insights into the auto industry as well as the inspiring creation of one of the world's most respected, influential, and independent consumer organizations.